"There's a reason why street judges are always in uniform." Judge Dredd would make short work of a lot of issues plaguing society nowadays. The only problem is that society may ultimately end up in a situation similar to that of Mega City One. Thankfully, we're not there yet and the only window we have into that world are books like Judge Dredd: Under Siege #1 from IDW Publishing. The issue is written by Mark Russell, illustrated by Max Dunbar, colored by Jose Luis Rio and lettered by Simon Bowland. Russell knows that in order to make a good Judge Dredd story you need the right amount of confrontation and he's got plenty of it. Judge Dredd as a character always thrives on having the last word and ending all confrontations which Russell uses to great effect as a plot device in the issue. The dialogue throughout the issue is very deliberate as it both gives the script good pace and perfectly captures what makes Judge Dredd tick. Russell also works in some empathetic characters in the down on their luck residents of the Patrick Swayze block. Most of the exchanges between Dredd and the aforementioned citizens are extremely well-done, with Russell pitting their knowledge of scraping together a survival against Dredd's singular focus of maintaining the law. Dunbar also knows that to make a good Judge Dredd story you need a physically imposing Dredd and he does an exceptional job there. Dunbar perfectly captures the iconic, stoic jawline of Dredd as a smaller part of his hulking frame, making him a truly intimidating dispenser of justice. Other characters are rendered with very concise linework that gives the book a sense of refinement. The combatants in the book are presented by Dunbar with a focus on their ferocity, upping the ante in their fight against the Judge and the inhabitants of the Patrick Swayze block. Rio's colors are calm while still maintaining a certain vibrancy. Judge Dredd: Under Siege #1 is a lot of fun. Dredd is up against tall odds, but it's not something entirely new for him. Dunbar manages to give the book a bit more in the way of social commentary as a great way of reminding the readers that the Judges have to contend with problems of their own making in a way. Dunbar's illustrations are gritty and action-packed. Judge Dredd: Under Siege #1 is a great first issue that reads extremely quickly and is a blast. 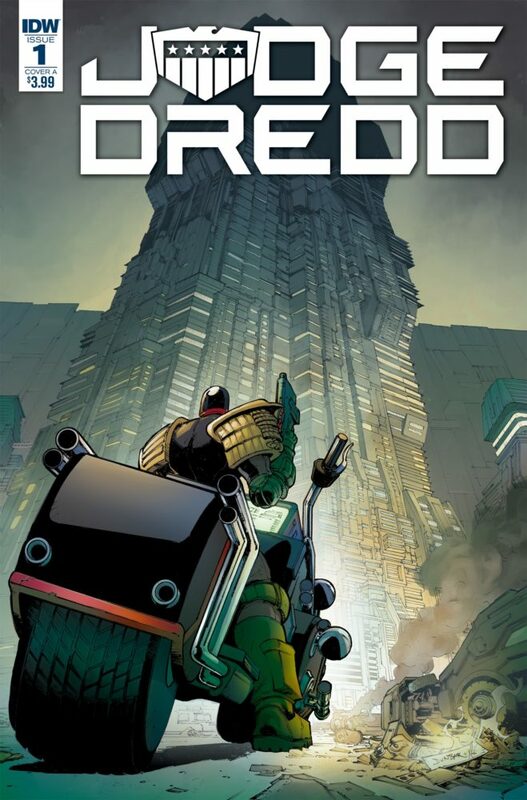 Judge Dredd: Under Siege #1 is available now.